On this day in history, April 15, 1741, Artist Charles Willson Peale is born. Peale would become one of the most prolific painters of prominent figures of the American Revolution. He was born in Queen Anne's County, Maryland and trained as a maker of horse saddles as a boy. He first became interested in art when he saw some paintings at the home of a wealthy client. Thinking the paintings weren't done very well, he tried his hand at painting his own images and found that he had a natural talent for it. Peale traded a saddle for several lessons from prominent Maryland and Pennsylvania painter John Hesselius and traveled to Boston to visit the studio of John Singleton Copley, another painter who would later specialize in paintings from the American Revolution. In time, wealthy Maryland planter and judge John Beale Bordley would raise money to send the young Peale to Europe where he studied for three years with American painter Benjamin West, who was then beginning to paint pictures for King George III. After returning to Annapolis, Peale set up his own studio where he displayed his own works and took commissions to do portraits. When the American Revolution broke out, Peale moved his family to Philadelphia and began painting portraits of prominent members of Congress and their families. During the Revolution and the years leading up to it, Peale painted more than 300 portraits, many of which you have probably seen, including portraits of John Hancock, Dorothy Quincy Hancock, Thomas Jefferson, Benjamin Franklin, Mercy Otis Warren, Henry Knox, Thomas McKean, Benjamin Rush and Nathanael Greene. Peale also served in several battles of the American Revolution. The first time George Washington sat for his portrait was with Charles Willson Peale in 1772. 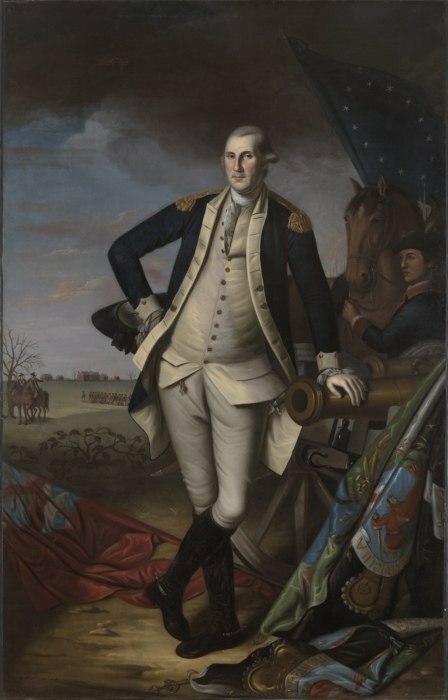 Peale would paint Washington seven times and place him in various settings, usually in military attire. Peale's portrait George Washington at the Battle of Princeton sold for more than $21 million dollars in 2005, the highest amount ever paid for an American painting at the time. 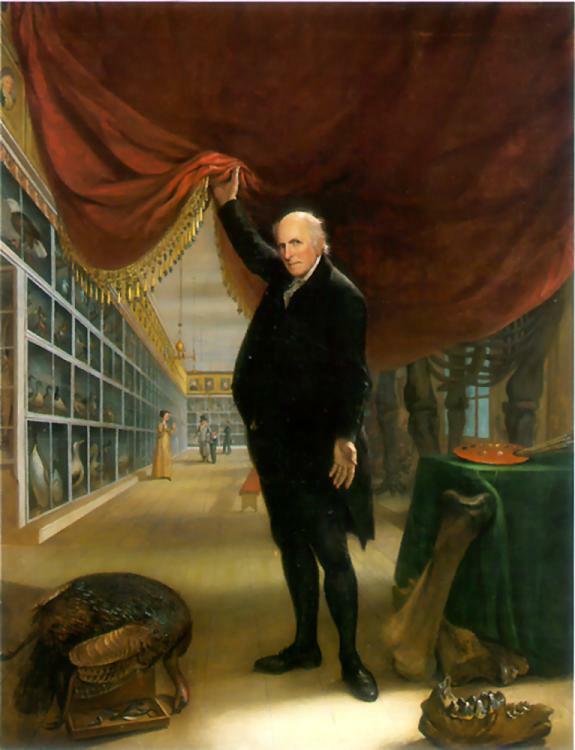 After the war, Peale became interested in natural history. He funded scientific expeditions and displayed artifacts and animal specimens in a museum in his home called the Philadelphia Museum. This would be the first museum of its kind in America. It would eventually be moved to larger quarters and would house such things as mastodon bones dug up in one of his expeditions, a large number of birds and American plant and animal species. This museum was the first to set up animal displays with painted backgrounds showing them in their natural habitat, many of which were mounted by Peale himself. The Philadelphia Museum was eventually sold to none other than entertainers PT Barnum and Moses Kimball after Peale's death. Peale spent his later years building the Pennsylvania Academy of the Fine Arts and continued painting until his death. He experimented in many different fields, including taxidermy, dentistry and optometry and wrote several books as well. Peale trained his own children in painting (all of the boys were named after artists or scientists) and several of them, including Rembrandt, Titian, Raphaelle and Rubens, became renowned artists in their own right. In addition to his sons, Peale also trained his brother James, his nieces Sarah Miriam and Anna Claypole Peale and his nephew Charles Peale Polk, all of whom became renowned painters as well.